Colour Wizard® Operatives work hard and enjoy great lifestyles and high incomes. If you want to earn around £60K a year, find out how you too, can join their success with our FREE Franchise Information Pack. We offer our customers a more professional service with better results because we use better processes and top-grade materials. Colour Wizard Operatives are professionally trained, with a unique pride in the quality of finish that we achieve on customer's vehicles. Many of our customers and clients have been disappointed by the car body repairs services offered by some of our competitors in the market because they are stuck in a downward spiral of poor support, training and opportunities. Less opportunity = more stress and less dedication to each repair = a poorer finish = less repeat business = an even more desperate need to find more customers = less time at each customer = poorer service = less repeat business. 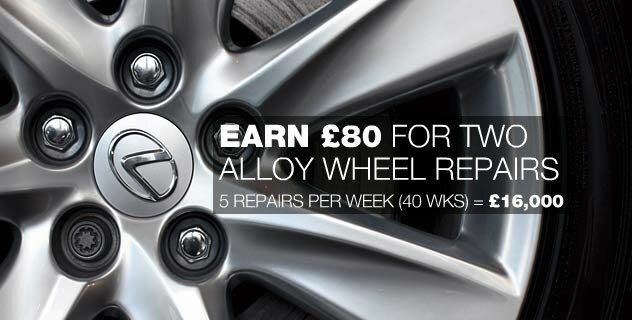 We provide all our customers with first class service and repairs, no matter what service they may need, whether its a minor dent removal or alloy wheel refurbishment. We are different because we enjoy a simple upward spiral, by doing things right in the first place. So you get a larger exclusive territory and can serve any type of customer so that you can concentrate on offering a great service without worrying about internal competition. Colour Wizard = a great service = a great finish = more repeat business = a competition beating reputation = loyal customer base = more business = greater potential income = a happy franchisee = a great service = a great finish = more repeat business. Come down to our body shop in Liverpool today to discuss our franchise business opportunities further and see our technicians at work, providing many of our car repairs services including alloy wheel repairs, minor dent removals and much more. Copyright © 2019 - Colour Wizard® Limited. All Rights Reserved.